✽ For the filling, cream together the butter and sugar until fluffy, beating with a wooden spoon. Beat in the eggs, one at a time. Mix in the almonds. Stir in the rum and almond extract. 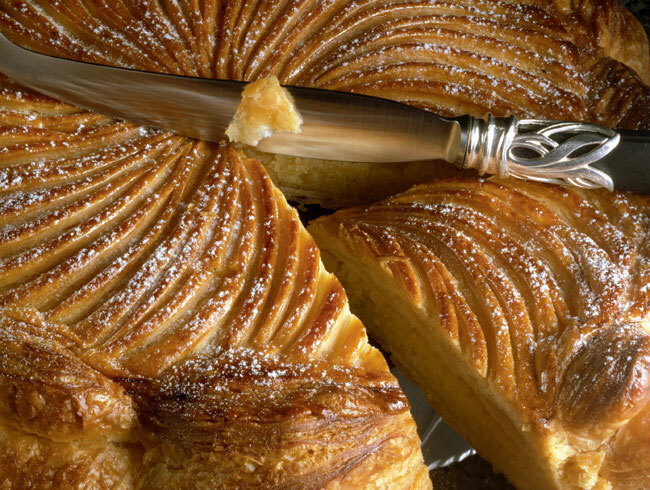 If you are including crème pâtissière, make a well in the filling and enclose it. Mould the filling into a neat hemisphere shape about 15cm (6 inches) in diameter. (You can do this by pressing it into a bowl lined with cling film/plastic wrap). ✽ Chill the filling, wrapped in cling film. ✽ On a lightly floured worktop, roll out the dough into 2 circles of about 22cm (9 inches) using a plate as a guide. Roll one circle slightly larger than the other. Transfer the smaller one, the base, to a baking sheet lined with silicone paper. Put the larger circle, the lid, on a separate plate. Chill them for about 20 minutes along with the trimmings. ✽ Preheat the oven to 200°C (400°F, gas mk 6). Remove the chilled dough and filling from the refrigerator. Place the filling in the centre of the dough base, leaving a border of at least 1cm (3/8 inch). ✽ Brush the border with beaten egg. Put the dough lid on top. Press the border to seal the edges. Pierce the centre to make a steam vent. Use the trimmings to decorate, or score the dough to resemble rays of sunshine. Glaze with beaten egg and bake for about 25 minutes or until golden brown. ✽ Transfer to a wire rack. Serve warm or at room temperature.